GEO600 is British-German laser interferometric gravitational wave detector with arm lengths of 600 metres, situated near Hannover, Germany. Since 2002, GEO has been operated by the Centre of Gravitational Physics of the Albert Einstein Institute (AEI), and Leibniz Universitat Hannover, together with the universities of Cardiff and Glasgow. GEO600 is capable of detecting gravitational waves in the frequency range 50Hz – 1.5kHz. It may observe some of the strongest Galactic sources of gravitational radiation, such as a rapidly spinning neutron star. Neutron stars can be as massive as our own Sun, but so dense that its radius is a mere 10 km. They spin so fast that a `day’ for such a star would be less than 10 milliseconds. Since 2002 GEO has completed several science runs, including joint science runs with the Virgo and LIGO detectors. The shorter arm-length of GEO600 compared to LIGO and Virgo poses a greater challenge in overcoming noise. To a certain degree, the amplitude of a gravitational wave signal scales with the length of the detector’s arms, and so GEO600 must compensate by employing special methods for increasing its sensitivity, such as shot noise squeezing. 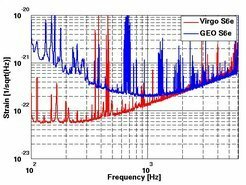 After implementing such techniques, the results of a joint run with Virgo in 2011 showed the GEO detector to be at least as sensitive as the larger detector above frequencies of 2kHz. Many of the various upgrades to the LIGO detectors implemented in 2015 (since dubbed “Advanced LIGO” or “aLIGO”) were developed with the help of the institutions within the GEO project. On September 18th 2015, GEO600 began taking data, coinciding with the first observing run of aLIGO.